Humor: Baby, just sit in the swing! My life is usually funny. When things go wrong, they don’t go average wrong. They go Charlie Chaplin style wrong. I did an entry on my writing blog about this tendency of my life because my friends are always pushing me to be the Erma Bombeck of my age. And I do love the classic Erma! 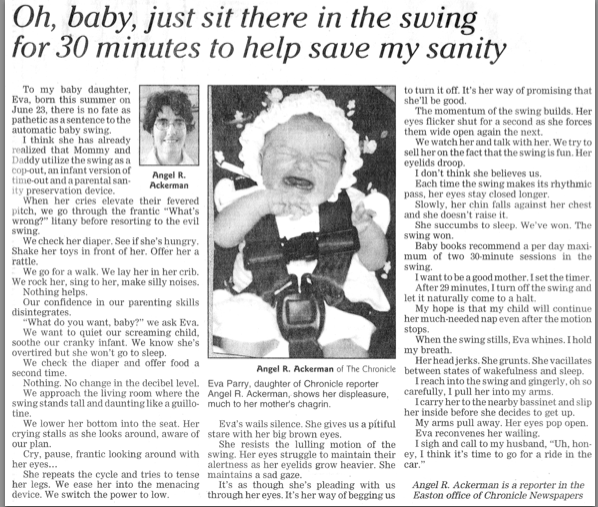 Here’s a newspaper clipping about my daughter that I think falls under humor.